Here at STONETREE, we use either Rainbird or Hunter sprinklers in all of our installations. You will be able to program your sprinkler on an automatic system to make sure your lawn is adequately watered, though it will require some monitoring on your part. When a sprinkler head is damaged you can lose gallons of water in minutes, causing your water bill to climb and your lawn to die. Do a quick visual inspection once a week. 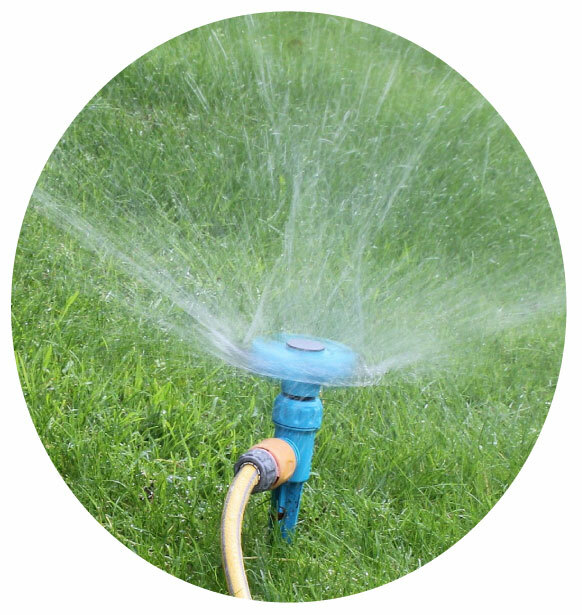 Look for pooling around the sprinkler head or abnormal water distribution. Any number of things can cause your sprinklers to distribute water unevenly (damage, clogged by lawn clippings, played with by children). If you notice sections of your lawn are looking wilted, set out water catchers evenly spaced between your sprinklers and check the distribution. Doing a quick visual check on the water’s spray from the sprinklers will give you a good idea if your sprinklers are outputting the same amount of pressure. They should all be spraying the same distance. Before you mow, be sure that all the sprinkler heads have retracted. Not only will an upstanding head get damaged when you mow but it can also damage your lawn mower. Winterizing your sprinkler system is not a common practice in St. George; however, it is recommended to do this during the winter months before the ﬁrst hard freeze. Any standing water in your sprinkler system when temperatures drop drastically will freeze and expand, which can cause breaks in your system. If you choose not to winterize your entire system, there are two parts of your sprinkler that you should take the time to insulate: the backﬂow and the valve box. The backﬂow is required by law in Washington County to be installed above ground, which can make this small copper piece more susceptible to freezing. The county requires this because when the backﬂow fails, you’ll know because it sprays water. If this piece is underground, it is difficult to detect its failure. To insulate the backﬂow and the valve box, you’ll place insulation bags around them for the coldest months of the year or as you anticipate dramatic drops in temperature. Insulate your main water shut-off valve and any above ground pipes with foam. Set your sprinkler system timer to “rain mode”. That way it continues to track time accurately and saves your sprinkler settings. Drain your pipes with either a manual drain valve, automatic drain valve, or using a compressed air blowout. Insulate any valves and backﬂow preventers you have above ground. There are a few common mistakes homeowners make when it comes to their sprinkler systems. A much higher water bill as damaged sprinklers pump water out into the street. Sometimes owners will replace damaged sprinkler parts with ones from another brand or something they already have on hand. You’re more likely to maintain the life of your sprinkler system by using parts made by the same company. Jerry-rigging or using parts created for a different system can cause more problems in the future. Winterizing your sprinkler system is not a common practice in St. George; however, it is recommended to do this during the winter months before the ﬁrst hard freeze. Any standing water in your sprinkler system when temperatures drop drastically will freeze and expand, which can cause breaks in your system. If you choose not to winterize your entire system, there are two parts of your sprinkler that you should take the time to insulate: the backﬂow and the valve box. The backﬂow is required by law in Washington County to be installed above ground, which can make this small copper piece more susceptible to freezing. The county requires this because when the backﬂow fails, you’ll know because it sprays water. If this piece is underground, it is difficult to detect its failure.